I recently received a flyer in the post from SouthernElectric. It’s a classic example of how, in recent years, a huge number of people in marketing, from the creatives to the clients, have utterly lost the plot – the industry is now full of people who really don’t have a clue about what they are supposed to do. Is that a red herring I see before me? Old electrical wiring can be riskier than you think. If your home is over 20 years old, give us a call. But what is the photograph that accompanies this? Smouldering wires? A burnt out room? No…it’s a shot of a teenager flying through the air on a BMX bike. The flyer is aimed at home owners. What’s the average age of first time buyers in the UK? Thirty five. How many thirty five year olds do you see playing around on BMX bikes? But the target audience is even older than this. Buy any house and you have to get a survey –It’ll be a condition of the mortgage. 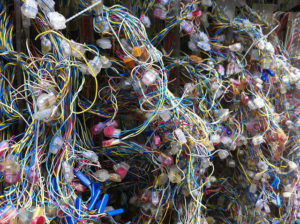 If the wiring is dodgy it will be picked up. So you won’t need another survey, free or not, from Southern Electric. That means the target audience is probably 45+ and knew the wiring was a bit tired when they bought the house ten years ago (but has been going through a lot of fuse wire in the meantime). How many people in their 50’s, 60’s and 70’s are going to think “ah, BMX bike, this is obviously something that’s relevant to me….I’d better read it carefully!”? Ho, ho, ho…that’s so punny! Then there’s the banal “jump at the chance” pun in the headline, followed by another one overleaf with “Land a free visual check” (geddit?!) – It’s insulting to my intelligence. Does this infantile sense of humour reassure me that these are the best people to rewire my house? No. So how did this disastrous flyer get produced and approved in the first place? Rewind 30 years and all will be revealed. In the 80’s producing this flyer would have been laborious. The account person writes a brief. The brief is approved by the creative director. It is passed to a copywriter/art director team. They produce rough concepts. If approved by the creative director these are worked up into finished visuals. Once signed off by the creative director they are passed to the account team, who check them against the brief then take them to the client. The client approves the visual and the flyer goes into production. The art director and art buying department set up and direct the photo shoot. The studio create the artwork, on a drawing board. The copywriter, art director, creative director and account team review it, make amendments, then sign off. The client finally approves and it goes to print. It was labour intensive and time consuming. But it did have a few things to recommend it. It was a systematic process. Everyone involved understood it and followed it. As a junior you realised there was “a right way to do things” and learnt why each stage was important. You were part of a team and had plenty of opportunities, and time, to learn from experienced practitioners. Secondly, a lot of time and effort went into the briefing and reviewing stages. You couldn’t afford to present ideas that the client rejected – too much time and money were involved. Thirdly, with all those people and stages, there were ample opportunities to question, challenge and discuss. Had this BMX flyer been proposed back in the 80’s (did we have BMX then?) someone would have shot it down in flames before it ever got visualised. This resulted in higher quality work – the crap got filtered out. It also produced more capable people – you learnt on the job from experienced practitioners who shared their knowledge. Designer gets back to desk and emails to account person, who loves it. They forward to client, also with marketing diploma and relatively new to job, who thinks it’s really imaginative. Account person knocks in some text and decides “hey, this copywriting thing is easy!” Finished file emailed to printer, job done. The result is rubbish. But it’s produced quickly and cheaply. Plus nobody involved knows any better. So what’s the problem? The problem that the response rate is nil. But so what? The account person, the designer and the client all move on within six months. They achieved nothing, learnt nothing and couldn’t care less. Oh how sad and how true. Staggeringly bad concept and shameful that it made it as far as the general public. Yes...they just sent me another one, this time with a cute kid on the from wearing oven gloves but no bad pun this time - just a weak message about safety...a slight improvement. Insightful as ever Jim, and I imagine a little too close for comfort for some folk. But looking on the bright side, were it not for such examples it might be more difficult to highlight the value of a reasoned approach to marketing. The worry is that with material like this appearing more often it becomes more acceptable – even expected! That's where creative practitioners' integrity is put to the test. Let's hear it for the folk that have a quiet word in their client's ear before this sort of thing gets in front of real people. let's raise a glass to all those who are still fighting the good fight! Absolutely cracking post and one that mirrors my own experience exactly. I cut my teeth as a junior copywriter back in the late 70s and was trained in the creative and production process you described so accurately. As you say, this has now almost vanished completely. To be replaced by the half-arsed, thrown together 'creative' work we see everywhere these days. Hopkins, Reeves, Bernbach, Caples, Ogilvy and every other ad man and woman who actually knew how to sell something must be wildly gyrating in their graves. glad it struck a chord with you. next month I must find something positive to write about!! It's not limited to Southern Electric. We had one in almost the same vein from EDF. Was it a job lot? Yes, they probably "did a deal"! While I totally agree with the article's premise, I take issue with the comment about BMX. The photo doesn't belong in the flyer, no. But BMX as a sport attracts an older crowd than you might think. There are lots of professional BMX riders in their 30s, ditto skateboarders. Just sayin! so it's the same in the States - I guessed as much. No point in me emigrating then? Loved the article - and so true. We seem to be going through a trend where images don't have to relate to anything relevant. In the good old days we worked on the idea that an image spoke a 1000 words and gave you some lovely white space to make the words you wrote really count.. I read a website this aftenoon that was a thing of beauty to look at but completely unrelated to what they did - the home page simply didn't tell you! On top of that the About section didn't enlighten me any further.. which is sad because you just know that it costs the same to get it right as it does to get it wrong in this case. Don't forget your hot chocolate! Websites...now that's a whole 'nother blog altogether...see way too much of this, Pam. Thanks Jim. Another example of 'Gen Why?' in action! i agree on all counts... if you want to see another example of moronic advertising check out the bing ad on page 3 (5?) of today's New York Times. "Goes on Getty Images and saves some wiring shots to lightbox. Can’t think of an idea. Checks Facebook." I was told that brainstorming nowadays means watching YouTube videos. I wouldn't know, I'm a writer in my late 30s. I once caught an intern copying a TVC when I asked her to help out on some ideas. Yes, it's really hard to come up with ideas when all you have between the ears is mental junk food. Result, McMarketing. GREAT post. I am both glad and saddened that the same thing is happening on your side of the pond as well as here in the States (hey, misery loves company). Couldn't agree more. Although when I was a full-time agency creative (before I decided to be paid a third as much for three times the effort freelancing), there was still plenty of crap. I think it just seems like there's more today because there's just more out there (like TV and film and comics and music). Guessing the percentage of good-to-bad is still similar. Hmmm...that would be a fascinating --if impossible--academic study, wouldn't it? With "crap-graphs" and all. Back in the 80s, though, they probably wouldn't have bothered with a photo shoot. There were plenty of stock houses that could have contributed a photo that had as little to do with the ad as this one. Shoots were expensive and not many clients would pay for 'em. But thank you for taking something so banal and saddening and entertaining us with it! May all your clients have deep pockets and open minds.